FG releases list of 69 ongoing road, bridge projects in the south-east – Royal Times of Nigeria. The Federal Government has released the list of the 69 ongoing road and bridge projects in the South-east (please see attached list). 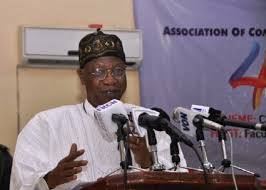 In a statement in Abuja on Monday, the Minister of Information and Culture, Alhaji Lai Mohammed, said though the contracts for many of the roads were awarded before the advent of this Administration, they were either poorly funded or not funded at all, hence work on the roads has lingered. The Minister said the 69 roads and bridges, which are spread across the five states in the South-east, are now in different stages of completion, thanks to the funding sourced by the present Administration from budgetary allocations, the Sukuk Bond and the Presidential Infrastructure Development Fund. He said the government is also looking into the possibility of using a part of the recovered looted funds to fund the development of infrastructure across the country. While announcing the projects, which include the rehabilitation of the existing Niger Bridge as well as the construction of the 2nd Niger Bridge last week, Alhaji Mohammed promised to publish the full list of the roads and bridges, as well as give a state-by-state breakdown of the total figure.